A boy is born in the land of Leo. As the sound of the cattle horn is heard, everyone in the Kingdom celebrates the birth of not only a boy, but the Crown Prince. His name is Ustawi. The hands that hold him foretell a prosperous future, but just like every dream has it’s valleys, so has Ustawi’s birth. One man has seen the evil that’s to befall the kingdom under the boy’s reign, his name is Ukweli. He is the Seer. Fire begins the story of the Prince’s life and as you read through a story rich in culture and customs you can only ask yourself, can the Seer fight the gods? Can he avert the impending doom that’s to come? Fire is a unique literature story, that focuses on East African folklore. Ms. Okeyo names her characters using the Swahili language. Each name, symbolizing what the character should be, what they could or should stand for. For example Ukweli in Swahili means Truth. I found this characterization quite insightful. The story is quite simple, a Crown Prince is born into the land of Leo, the heir to his father’s throne, but instead of joy, the Seer, Ukweli is tormented by dreams of doom and darkness as he foresees the worst. According to Ukweli, the land of Leo is going to face hard and dark times under the rule of Crown Prince Ustawi. Tormented by this dreams, Ukweli goes on a journey hoping to find a solution, and on his journey, he finds more questions, and proof that Prince Ustawi’s reign will cause pain to the people of Leo. Ms. Okeyo paints a great folklore tale, weaving in East African’s own culture into her story. You’re treated to scenes of palatial huts, cloaks made with animal skin, and elders in a circle, and that just made me smile. 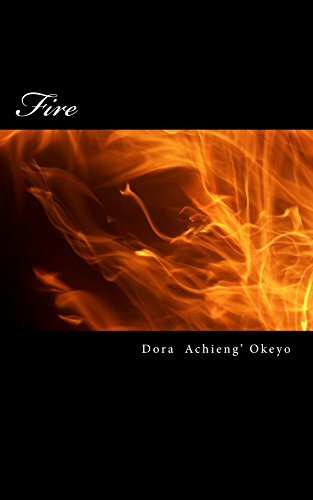 The genre is a different approach for Ms. Okeyo, I’ve only read romance stories from her before, but this is different and she’s set herself apart with Fire. It did take me a lot longer to read. You really need to settle down and get through each page to understand why Ukweli is moving from one place to another, and enduring so much torment. This is not a complaint, more of a judgment of my own reading capabilities, I think. I need to hone them, or something…^_^! It reminded me of reading a literature set book, you gotta keep your focus to understand what’s going on. This is not your fast romantic tale, definitely requires undivided attention. Once you get going, Fire is a captivating read! I am a full time wanderer for now. You’ll find me within the pages of a book. I have written some books, why don’t you read them and get a glimpse. I love set books, and to learn that my first book holds some weight like such books, I would only say that it makes me feel like I have started climbing a mountain and that no matter what happens, I have to reach the peak.